With its own 600-acre lake cleared to create multiple pond hockey rinks and the country’s longest maintained skating trail (4.5 miles), Lake Morey, Fairlee, Vermont, is an icy playground for winter enthusiasts. 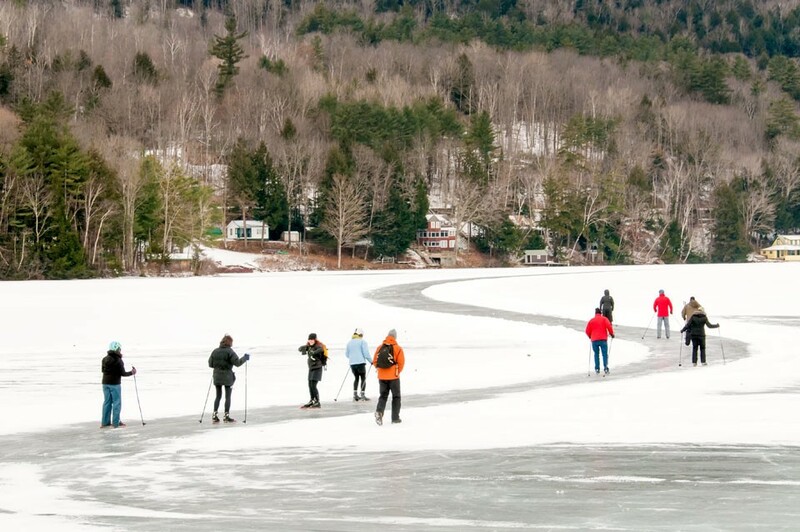 Lake Morey Resort in Fairlee, VT offers a variety of ice-based outdoor winter activities that get the blood pumping in ways other than downhill skiing. With its own 600-acre lake cleared to create multiple pond hockey rinks and the country’s longest maintained skating trail (4.5 miles), Lake Morey is an icy playground for winter enthusiasts. During Ice Sports University (ISU) weekend, January 23-25, 2015, guests can sweep a curling stone down the ice, compete in an invigorating game of pond hockey, circle the lake on Nordic Skates or discover the secrets to ice fishing. Snowshoeing and cross country skiing are also available for more snow-minded folks. Open to beginners through advanced, experts in each field will be on hand giving complimentary one-hour workshops in each activity for those who need it, culminating in a friendly competition for those who wish to test their skills. Rates start at $149 based on single or double occupancy. Extra people sharing a room would be $20 per person, per night. The rate includes two nights lodging and all workshops. All equipment (except helmets) will be provided onsite. For those not interested in hitting the ice, there are plenty of spectator sports to enjoy as well. In addition to the ongoing workshops, Lake Morey Resort has partnered with the Upper Valley Curling Club to bring a weekend of curling competition to the lake during the second annual Pondspiel. Catch the action lakeside or while sipping a warm beverage in the Steamboat Lounge. Throughout the weekend, the resort’s complimentary 120-seat indoor movie theater will also be streaming classic winter-sports-themed movies and a variety of other indoor activities are available, from swimming and table tennis to massages and other treatments in the resort’s Waters Spa. For more information and to book, visit www.lakemoreyresort.com or call 800-423-1211. Lake Morey Resort is located at 1 Clubhouse Road, Fairlee, VT 05045.